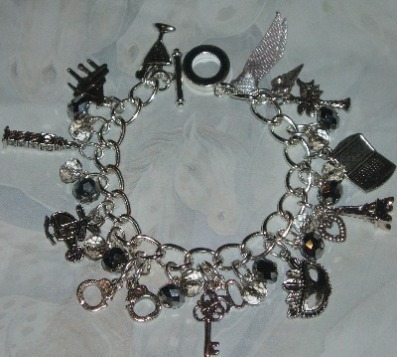 50 Shades of Grey handmade charm bracelet loaded with cocktail glass, piano, Big Ben, Charlie Tango helicopter, handcuffs, key, 50, mask, Eiffel tower, heart, computer, palm tree and ice cream cone charms, a little grey neck tie and lots of silver and metallic silver faceted crystal rondelles. You can now select to have a sterling silver chain. This bracelet will have more charms and look slightly different as there are more links to fill.